You know how easy it is to discount a beauty brand you always see in the dollar store? Well, it’s time to stop thanks to L.A. Colors. I’ve seen their products at my local Dollar Tree and Big Lots for years, but never thought much of them, and should have known better. 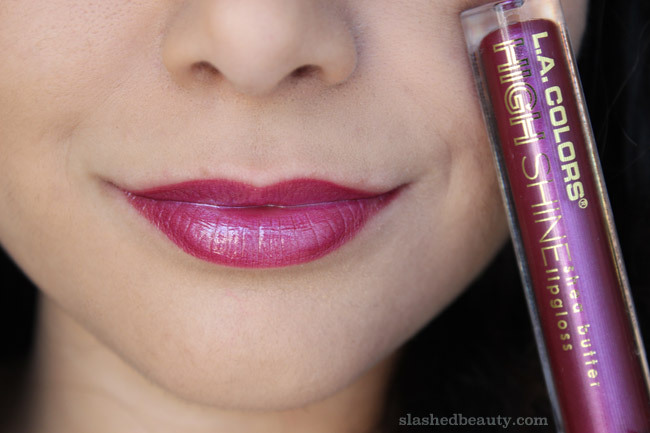 I recently took a chance on their High Shine Shea Butter Lipgloss because, why not. They looked gorgeous in the packaging, but I’ll admit I wasn’t expecting a lot out of them. Although I’ve been converted from total lipgloss hater to curious explorer thanks to a few choice formulas, I’m still super apprehensive about trying new ones. But I’m so glad I cracked these babies open! I added five of the glosses to my collection, and there wasn’t one dud in the batch. Let’s jump right into swatches because I have a feeling you’ll be just as surprised as I was. Flaunt is a gorgeous hot pink that is almost neon-bright and will unapologetically add a pop of bold color to any look. Dynamite is a classic warm red that is perfect for the upcoming holidays or any classic look. Playful is an intense frosty metallic pink that lives up to its high shine name. It’s great alone but would look fantastic layered on top of lipstick. Mingle is hands down my favorite— a duochrome purple/pink that shifts in the light. Too freaking gorgeous. Right off the bat, the pigmentation won me over. 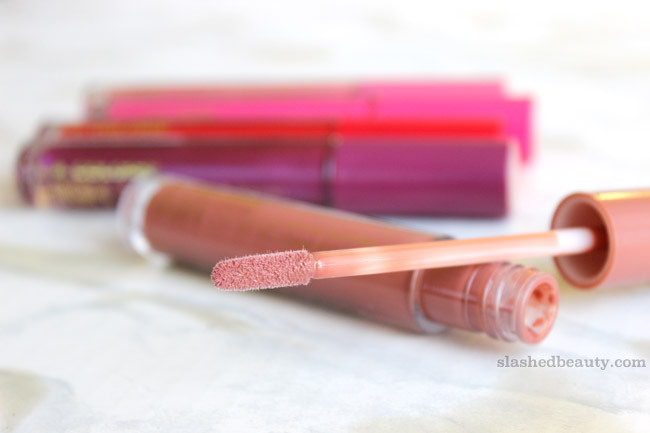 So much more than I would expect from any lipgloss, completely opaque in one swipe. 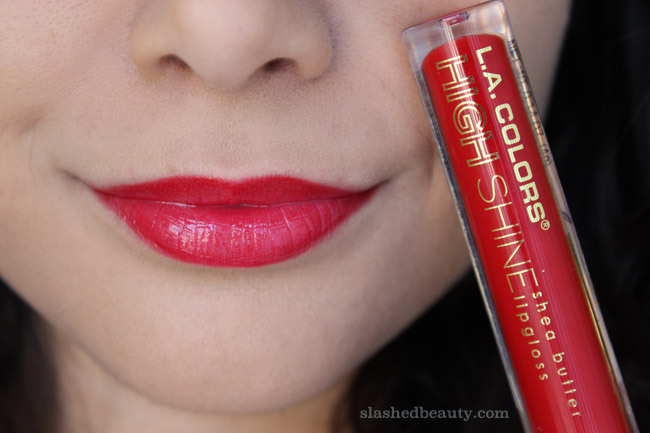 While they very much look like liquid lipsticks, they have a very thin glossy formula that is incredibly moisturizing thanks to the shea butter in it. They’re totally great for this upcoming season when our lips need extra love, since they not only look beautiful but feel really comfortable. No stickiness, just cushy and hydrating. Because the formula is thin, I strongly suggest putting down a lipliner prior to applying, or just be careful about using too much because they are prone to feather outside the lip lines. 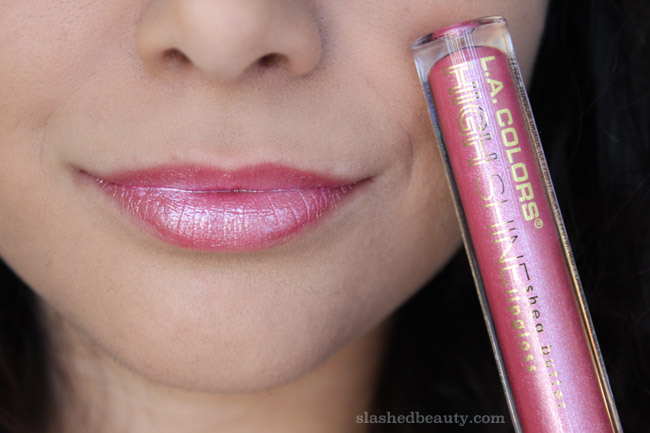 Being a gloss, there is also transfer, but the deeper shades leave behind a nice even stain. As a budget beauty blogger, I should have known that an uber affordable brand can still deliver gorgeous products. 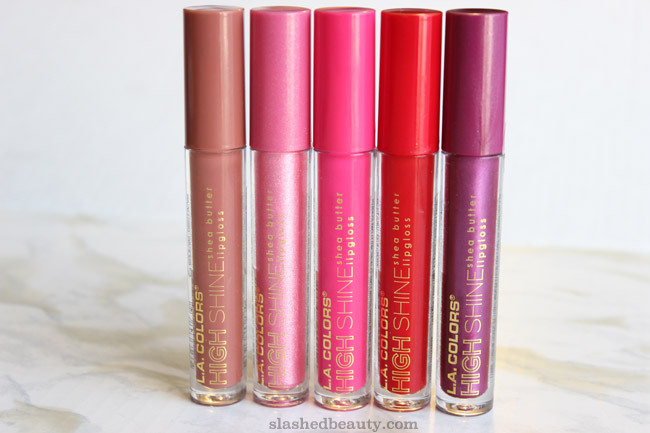 These lip glosses are going to get a ton of use out of me, and I’m going to be on the look out for the rest of the collection since there are 18 shades in total. Sometimes you can find L.A. Colors at Rite Aid and Walmart as well, so I’ll be searching! Have you ever taken a chance on dollar store makeup with good luck? Don’t forget to pin your favorite shade! I’ve been looking in vain for a true red gloss that won’t go dark pink on NW15 me, and “Dynamite” looks like a contender! It’s definitely the one I get most use out of 🙂 Thanks for commenting! I actually think I may want all of these. Can’t talk–going to Big Lots to search for these!!!! Wow – the color pay off on these are really nice. 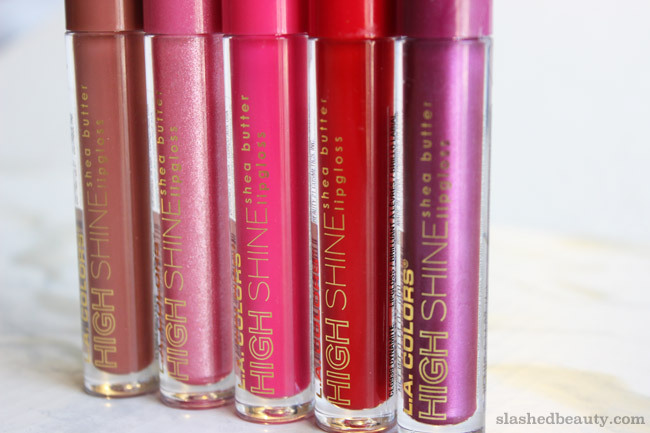 I think that when it comes to gloss, I’m not a huge fan but I would totally pick these up and try them. Those are all great shades on you but the top one is perfect. I love all of these. Playful would be the hardest for me to pull off, but I still want to try it. Great swatches. I love the hot pink one! Those are beautiful. I’ll have to keep out an eye for these. I’m loving all of the colors -especially flaunt. At this price though, it’s ok to get them all. These colors are so pretty! I love Dollface!